There are some clown tricks that will always be funny. For instance, see that rose fixed to that clown's lapel? If not, just imagine it. The clown is going to want you to give it a sniff. And sure, you'll smell it. What could happen, right? But whoops, the clown squeezes the little ball in his pocket and a jet of water sprays out of that bud into your face. It's a classic bit! It gets us every time! People see it coming and yet they still let themselves fall for it. Because when you're around clowns, you've just got to let loose. Clowns are all about the classics. That's why, when you're taking on this role, you gotta stick to the uniform. Big shoes, an oversized smile, and an oversized bow tie. Have you ever tried to tie a giant bow tie? That could be an act in itself cause it's not easy! 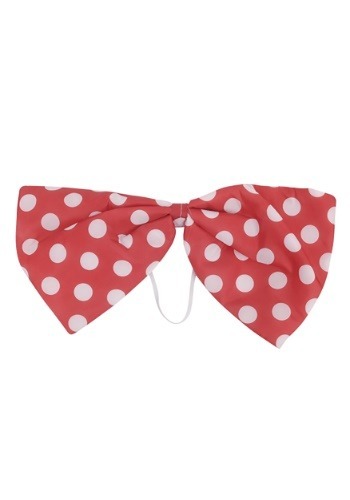 Make sure you're looking spiffy without sweating the details when you slip this polka dot bowtie around your neck. It has a faded, retro red color with classic large polka dots and an easy elastic back that'll keep you comfortable so you can focus on fitting yourself into that tiny car.